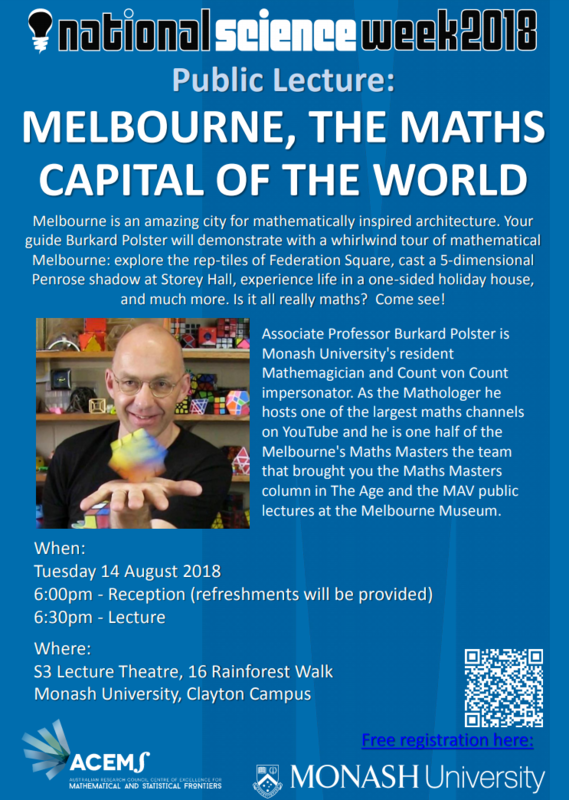 Next week is National Science Week and there are a few mathematics activities happening around Melbourne that are being sponsored by ACEMS. Public Talk: Is this your card? Pick a card, any card! The immortal phrase of the magician. In this talk, we’ll look at some great card tricks that have simple maths behind them. This show is for all ages, so bring a deck of cards, a pen and some paper and we’ll do mathematical magic. The MATHS ARCADE is a night of everyone’s favourites: computer games and mathematics! Just like a rad video arcade back in the day, we’ll have heaps of awesome games, and you don’t even need any coins. Come and compete to get your initials in the Hall of Fame! There will be plentiful food, drinks, maths and fun.